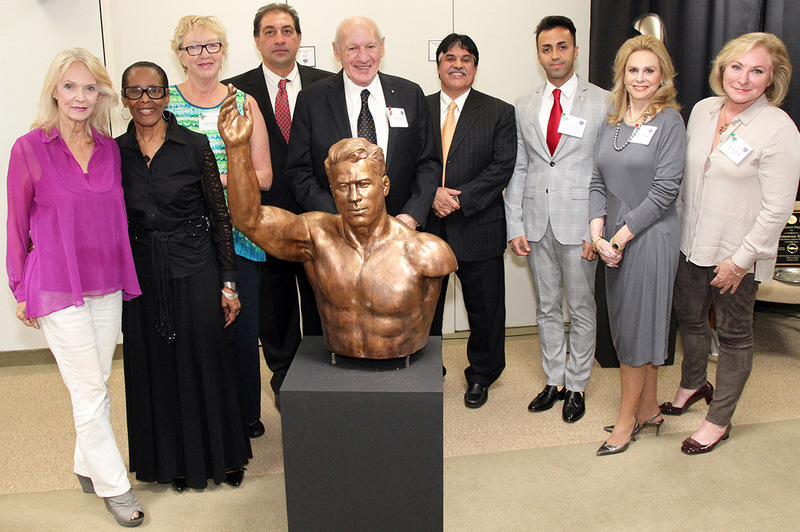 Members of the United States Sports Academy’s Art Committee participated in the unveiling ceremony of a sculpture of legendary Iranian wrestler Jahan Pahlavan Takhti presented to the American Sport Art Museum & Archives (ASAMA) by the North American Iranian Friendship Society (NAIFS). From left are committee members Kay Daughdrill; B.J. Cooper; and chair Nancy Raia; Babak Takhti, son of the late Jahan Pahlavan Takhti; Academy Founding President and committee member Dr. Thomas P. Rosandich; Ebrahim Maghsoud, NAIFS President and President of the Hafez Corp. in Mobile, Ala.; Vahid Abideh, NAIFS Founder and CEO and Secretary General of Iran’s Young Journalists Society; committee member emerita and Academy Trustee Susan McCollough; and committee member B’Beth Weldon. Takhti was the real champion. He was the one who , when he saw American wrestle’s hand is hurt, he also used one hand for the much.